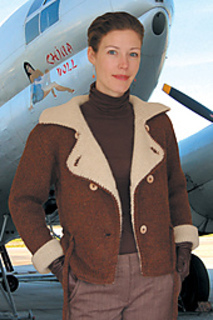 This knit bomber jacket will bring out the explorer in knitters who love an exciting project. Knit in two identical, but separate and contrasting pieces, the lining fits neatly into the exterior piece, adding to its warmth and allowing contrast in the turn back collar and cuffs, reminiscent of it’s original sheepskin counterpart. The jacket is fitted slightly and it’s 5-button closure and I-cord belt keep it close on those days when you are flying into the wind.